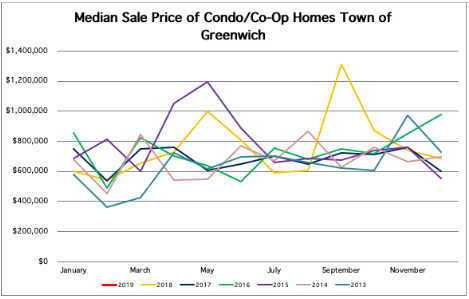 February 21, 2019 (Greenwich, CT) – The Greenwich Association of REALTORS® announces the statistics for home sales in The Town of Greenwich, CT for the month of January 2019. 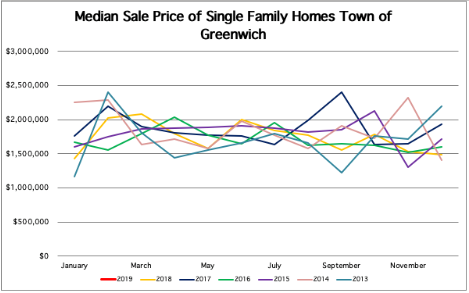 There were 27 single-family residential closings reported during this period according to figures provided by The Greenwich Multiple Listing Service, Inc., the multiple listing service used by REALTORS® in the Greenwich area. The number of single-family residential closings decreased, compared to January 2018 when there were 30 closings in January. The median sale price for a single-family home increased to $2,000,000 from $1,431,250 the median sales price in January 2018. The average days on the market (DOM) for residential homes was 241 days; which was an increase from 237 days in January 2018. There were 12 condo/co-op residential closings reported during this time period; which was an increase from January 2018 when there were 11 closings. The median sale price for a condo/co-op increased to $688,750 from $600,000 the median sales price in January 2018. The average days on the market (DOM) for condo/co-op residential homes was 158; which was an increase from 150 days in January 2018. “January 2019 began the year with twenty-seven closings. The median sale price had a thirty-nine percent increase to $2,000,000 from $1,431,250 in January 2018. Greenwich started the year as the area in town with the most closings, ending January with thirteen sales. Old Greenwich was close behind with ten sales. Condo/Co-Op sales had twelve closings in January 2019; A nine percent increase from January 2018. Pending sales as of 8:30am this morning for Single Family homes were forty-one and thirteen for Condo/Co-Op. January 2019 started the year off, following the pattern of sales from the previous years, dated back to 2013. With the spring market approaching, we hope to see an increase of closings from our last year sales”, stated John McAtee, 2019 President of the Greenwich Association of REALTORS®.